The manner in which South Africa dealt with its past and the process of granting amnesty through the Truth and Reconciliation Commission is generally considered legitimate. This is not the case, however, for many other amnesties granted in times of political transition or in post-conflict situations. National efforts to establish peace and democracy often clash with international legal demands. 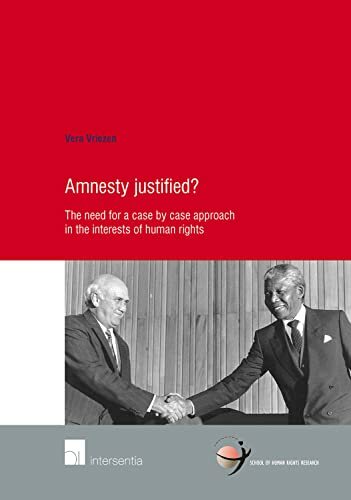 Notwithstanding the practice of nation states often preferring amnesty to prosecution as a means of dealing with their violent past, international law is clearly moving in a direction in which impunity and thus amnesty have no place. Nevertheless, in political transitions or post-conflict situations, states need to balance the need to (re)build the rule of law with the need to end human rights violations. Foreclosing the possibility of granting amnesty might seriously invalidate a useful tool for ending or preventing wars, facilitating the transition to democratic civilian regimes or aiding the process of reconciliation. The core question of this study is what kind of amnesty laws can be considered legitimate in the light of the need to combine respect for human rights and the rule of law with the need to restore peace and public order. The study is dedicated to answering that question by examining the legality of national amnesty laws under international law, by looking into the United Nations' position and practice on the subject, and by defining the rights of victims related to the practice of granting amnesty. The author determines the factors that are of importance when reviewing an amnesty measure or for actors considering granting amnesty, and develops a framework for the legitimate use of amnesty.